Is there anything more important than the healthy growth and development of your children? If you could do anything to aid and support the evolving brain of your child, you’d do it, right? So, how much sleep do kids really need? Babies, children and teens need significantly more sleep than adults, due to their rapidly developing brains. You need to make sure you’re providing them with a mattress that will help in their development, as even missing as little as 30 to 60 minutes of sleep time can have negative consequences on the mental and physical health of a child. It can be hard to tell if kids aren’t getting sufficient sleep, because children who haven’t had enough rest don’t necessarily slow down like adults do – they wind up. To an adult eye, sleepiness in kids can appear to show the symptoms of attention deficit-hyperactivity disorder (ADHD). It may seem like your child is not tired – they may even resist bedtime and become more hyper as the night goes on. These are actually symptoms of a child that is overtired. Circadian rhythms, or the sleep-wake cycle, are regulated by both light and dark, and these rhythms take time to develop, which is why newborns have such an irregular sleep schedule. At about six weeks the rhythms start to develop – and by three to six months, most infants have a regular sleep cycle. By two years of age, most children have spent more time asleep than awake and overall, a child will spend around 40 percent of their childhood asleep. This sleep is crucial, as it directly impacts mental and physical development. Learn more about all of our bed options for the whole family. Non-Rapid Eye Movement (NREM) – this is “quiet” sleep. During the deep states of NREM sleep, blood supply to the muscles is increased, energy is restored, tissue growth and repair occur and important hormones for growth and development are released. Rapid Eye Movement (REM) – this is “active” sleep. During REM sleep, our brains are active and dreaming occurs. Our breathing and heart rates are irregular, and our bodies become immobile. Babies spend 50 percent of their time in each of these states and their sleep cycle is about 50 minutes. At about six months, REM sleep comprises about 30 percent of their sleep. By the time they reach preschool age, their sleep cycle is about every 90 minutes. Researchers and clinicians are finding that sleep apnea – which most people think of as an adult disorder – is relatively common in the young as well. Someone suffering from sleep apnea wakes up many times an hour, very briefly, and can struggle to breathe. Most people don’t know they’re experiencing sleep apnea unless they are told by a medical professional or take a test to confirm that’s what it is. Does your child snore? They may be currently suffering from the sleep disorder known as sleep apnea – ask your pediatrician for more information about your child’s condition. The right pillow can make all the difference! 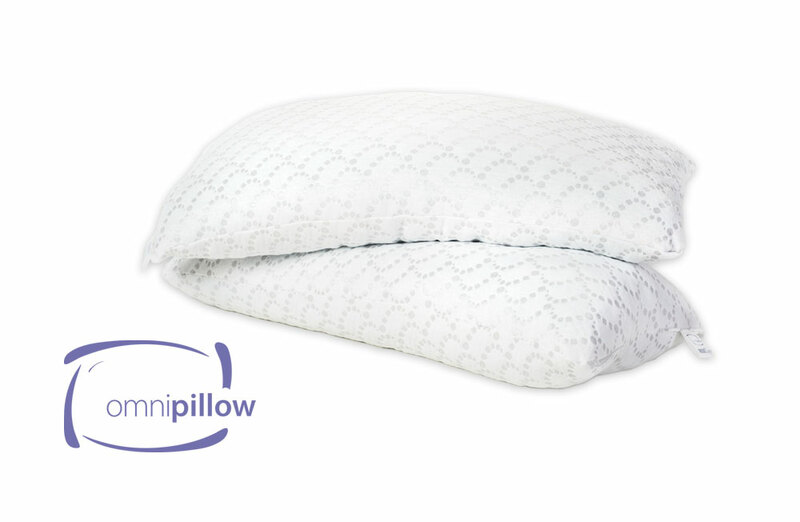 Learn more about the OmniPillow and purchase yours today! In many cases, sleep deprivation in children can be helped by changes to the environment and habits surrounding bedtime – including the type of mattress you’re using for your child. An early bedtime – between 7:00 & 8:00 p.m. works best for babies and kids through school age – with a consistent, soothing, wind-down routine with no screen time will help lead to better sleep and will help your child develop good sleep habits. Newborns typically sleep between 15 and 18 hours a day, but in short periods of 2 to 4 hours. Premature babies tend to sleep longer – colicky babies sleep for shorter. Newborns do not possess an internal biological clock, or circadian rhythm – their sleep patterns aren’t related to the daylight and nighttime cycles. Newborns tend to have no pattern at all. More regular sleep patterns tend to emerge in this time period. By 6 weeks of age, your baby should be starting to settle down a little bit. Day-night confusion should end, and the longer periods of sleep of 4 to 6 hours now tend to occur more regularly in the evening. Most infants up to 11 months old get only about 12 hours. Babies typically have three naps a day – this can drop to two at around 6 months, as they’re now physically capable of sleeping through the night. In the later portion of this time frame, babies may begin to establish regular nap times – this is due to their biological rhythms maturing. You may notice they take a midmorning nap, an early afternoon nap and a late afternoon nap. These will all vary in length. At these ages, we typically start to see one nap per day. Toddlers need up to 14 hours a day of sleep, but oftentimes will only get 10. Children between the ages of 21 to 36 months still need one nap a day, which may range from one to three hours long. 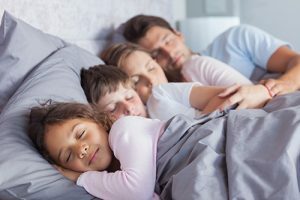 They’ll typically go to bed between 7 & 9 p.m. and wake up between 6 & 8 a.m.
At this age, children typically go to bed between 7 & 9 p.m. and wake up around 6 & 8 a.m. At the age of three, most children are still napping. By 5, most are not. Naps become shorter as they progress in age, as well. New sleep problems typically don’t develop after the age of 3. With school, social and family activities, bedtimes gradually go later into the night. Most 12-year-olds go to bed around 9 p.m., but there’s still a wide range of bedtimes, and total sleep times at this age – the average being about 9 hours. A good night’s rest is still vital to health and well-being for teens. Many teenagers aren’t getting the sleep they need due to social pressures, too much time on a screen, or too much homework and school responsibilities. Consult with the experts at Beds By Design for a mattress that will meet the needs of your family. We’ll make sure your child is on a mattress meant for them and that they’ll get the rest their developing brain needs. We manufacture all of our mattresses on site, saving you money. Learn more about the Easy Comfort bed, which is great for growing children, and the Cloud series which is perfect for teens getting ready to move to college.